Every other day or so, my bike and I cross the Calapooia River on the Third Avenue Bridge. So it was of more than passing interest when I read that the bridge’s substructure was in “critical” shape. His letter also recommended that based on a load rating of the superstructure and crossbeams only, the bridge should be posted with a load limit of 30 tons for vehicles with six or seven axles such as large construction rigs. 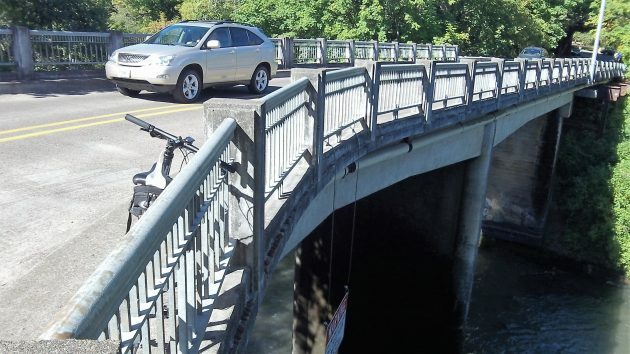 The city staff is asking the council to authorize this, and also to amend the municipal code to remove a 10-ton limit imposed before the bridge was repaired in 1974 and not repealed afterward. The 30-ton limit would have little or no practical effect; most vehicles of that size don’t use the bridge anyway because of the railroad trestle and sharp curve at its lower end. The problem is scouring at the bottom of the bridge supports where the Santiam Canal drops into the Calapooia in a powerful — and noisy — waterfall. Annual inspections have shown no worsening of the scouring. Still, there is “some concern,” according to the staff memo from Chris Bailey, director of public works operations. The Third Avenue bridge leads to Bryant Park and, via Bryant Drive, to Riverside Drive. Well that sure is a downer! The fact being that the crumbling infrastructure of America hits pretty damn close to home. Read into this that even the most minor of Earth tremble & this bridge will crumble down or, at the very least, sustain significant damage. If we need to cross, I’m guessing we should go at a slow roll? How about a foot/bike bridge across the Calapooia River downstream of the Third Avenue Bridge? Easy access to Bryant Park for sports on weekends. Bryant Park could also serve as a “park and walk” to downtown from the southwest during business hours when park use is low, and during nighttime events at the waterfront. It could even add to the quirky spirit fostered by the carousel and help make that little corner of Albany into quite a gem! Threatened fish. For cryin’ out loud… who’s in charge here? The fish? They should build a replica of the covered bridge that use to be here.